York360 - view more 360 movies and photos of York. 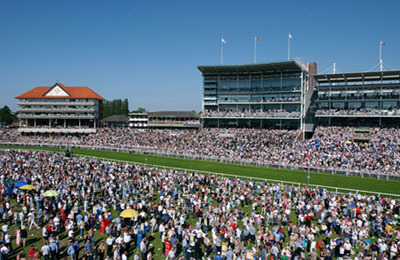 York Racecourse also known as 'The Knavesmire', is situated to the southwest of the city of York. In the movie above you can see the huge stands including the Knavesmire Stand, Ebor Stand and Melrose Stand. Also showing the Winning Post and course enclosure in the centre of the course. The most famous race to be held at York every year is the 'Ebor Handicap', which is run during the Ebor Festival meeting in August. The course also stages three of the UK's Group One races, the International Stakes, the Nunthorpe Stakes and the Yorkshire Oaks. Royal Ascot was held at York Racecourse June 2005, when Ascot Racecourse was closed for a multi-million redevelopment. The Stands on Race Day.